The Georgia Experience 2nd Grade Digital Biography Readers are available for select historic figures listed in the Georgia Standards of Excellence. 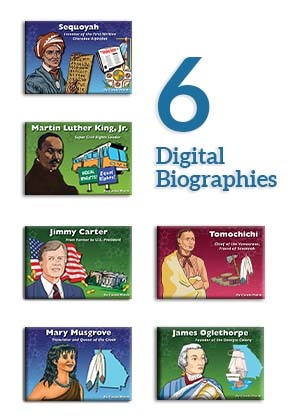 The Georgia Experience 2nd Grade Digital Biography Readers include everything in the Print Biography Readers, but in a digital format with videos and sound effects. 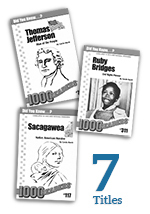 The Georgia Experience 2nd Grade Digital Biography Reader Set includes easy-to-read stories, fun activities, and a reproducible two-page Student Activity Sheet. Students build reading skills while learning important social studies content. 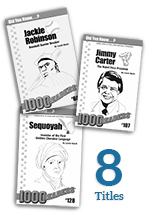 A Teacher License is a 1-year license and allows a teacher to use this reader in their classroom as much as they want. To see a FREE DIGITAL READER DEMO, click HERE. To learn more about our digital readers, watch the video below. 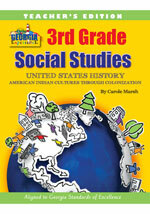 If you have any questions about our curriculum products, please contact Mary Davis at 800.536.2438, Ext. 13 or click HERE to contact Mary by email. 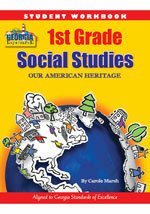 For more information, click HERE to go to the Georgia Curriculum web site. All public institutions and/or established accounts with authorized purchase orders may charge their orders, Terms are Net 30 days. Price subject to change. Not responsible for errors or omissions in this catalog. Gallopade is a sole-source provider for the Georgia Curriculum products. Please include catalog code GA18 on all ordering methods. 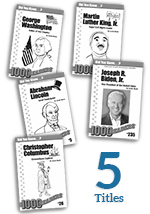 View the Georgia Curriculum 2018 – 2019 Catalog online HERE. Download the Georgia Curriculum 2018 - 2019 Social Studies Catalog HERE. Copyright © 2018 Gallopade. All rights reserved.